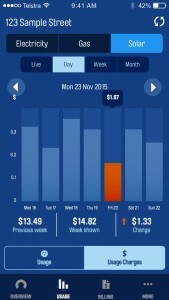 In my last article, I mentioned that my husband Nathan is addicted to the AGL Energy mobile app. In this post, I explain how it works and why Nathan likes it so much. When we built our new house, we tossed up the cost and benefits of solar power. Nathan and I both feel strongly about “going green”, but we’re also budget conscious (no surprises there) and the investment needed to make financial sense. Ultimately, we decided to go ahead because we plan to stay in our new home for a long time and the system should repay itself within five or six years. Down the track, we may also invest in a battery storage system that would allow us to become even more energy self-sufficient. 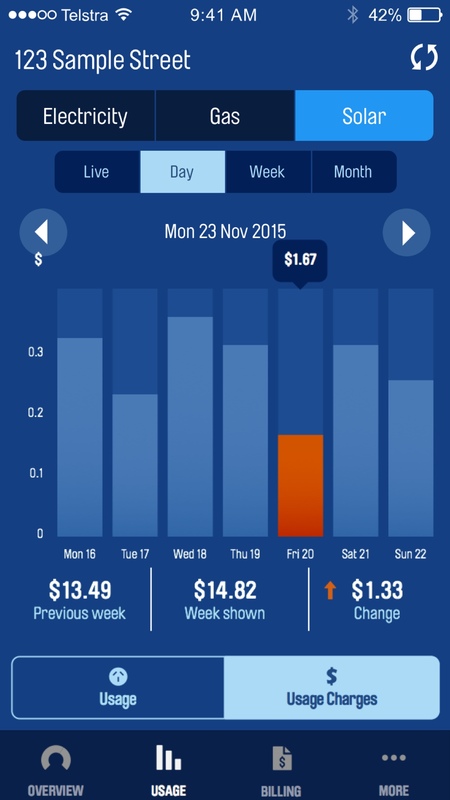 The AGL Energy mobile app allows you to monitor your power usage. This is where the AGL Energy mobile app comes in. Because we have a digital meter at our property, the app allows us to monitor our electricity use and compare consumption on an annual, monthly, weekly and daily basis. We can even see the difference when a light is accidentally left on during the day. Using the AGL Energy App, we’ve been able to work out the best time to run our major appliances, such as the washing machine, dishwasher and pool pump. Using the solar command feature, which lets us control our energy in real time, we use the timer function on our appliances to operate them during the day when our solar panels are at peak production. I find the AGL Energy App handy because I can compare my usage and costs over the last year, which is great for budgeting, and it’s easy to manage multiple energy sources (electricity, gas and solar) from the one location. If you have a digital meter, there’s an alert feature which allows you to set a spend target and will notify you when you get to your chosen amount, helping you stay on track with budgeting. My guess is that Nathan’s enjoyment of the app comes from the fact that he approaches it like a video game where the aim is to get the lowest score! When I told him I was writing this article, he said, “We used 3.2 kilowatts less electricity last week, but I’m pretty sure we can go lower.” Being able to monitor your utility usage is one of the keys to keeping power costs down and it protects against bill shock. The AGL Energy mobile app can be downloaded from the App Store or Google Play. Find out more about AGL Energy visit www.aglenergy.com.au or call 131 245. Written in cooperation with AGL.